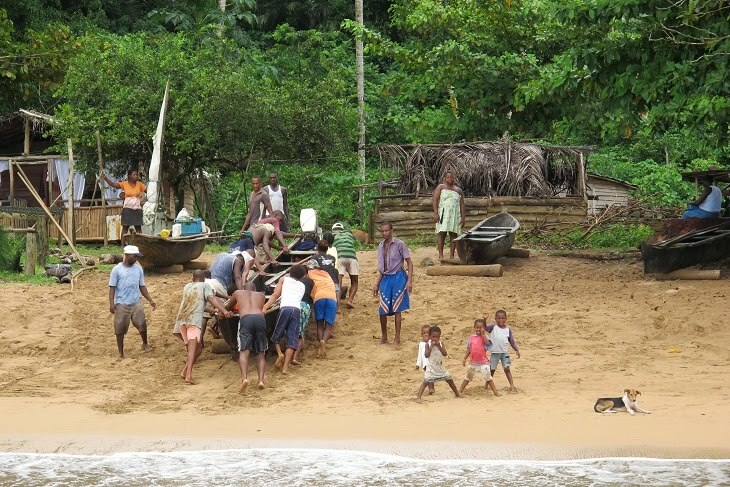 Described to us as the 'poor second cousin' to neighbouring São Tomé, little Principe is less than a quarter the size of its 852sqkm relative. Torrential rain had put the mockers on our land-based, vehicular excursions, o we were confined to the ultra-exclusive Bom Bom Island Resort, owned by the famous South African IT entrepreneur and first tourist in space, Mark Shuttleworth. 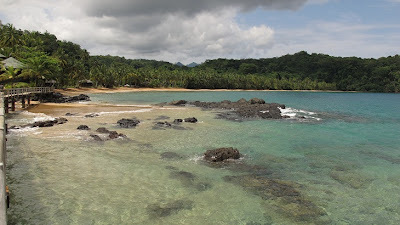 Perched on the end of a volcanic outcrop and embraced by two magnificent beaches, the well-blended resort attracts mainly European guests not encumbered by São Tomé's poor air links. 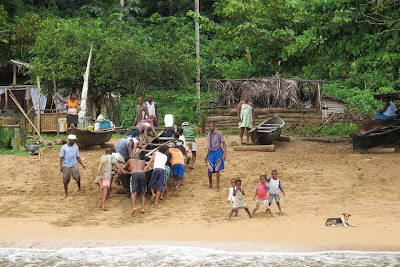 We soon learn that the apparently idyllic position hides a multitude of environmental sins over the ridge behind where cocoa and other crops have decimated the precious landscape, home to dozens of endangered endemic species of flora and fauna. One of our team, Dr Steve Boyes later painted us a totally realistic picture of the damage done by deforestation and cultivation not evident as we earlier lolled about the pool and bar. Groups peel off to make the best they can of the situation and ad hoc Zodiac cruises turn out to be something of a revelation, allowing us to see and occasionally engage with the tiny local fishing communities dotted around the coast. My skipper, David van Neikerk, is clearly equally at home on the sea as he is among his cherished vineyards of High Constantia. 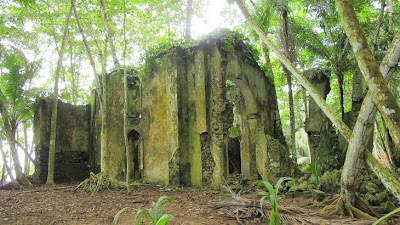 We putter about investigating every curiosity from seething bait balls to some mysterious ruins that turn out to be what's left of the original Portuguese settlement, founded in 1471 (if my source is correct). The remnants of what appears to be a church is overgrown and swathed in moss. The once grand arches and vestibules have been invaded by roots, vines and creepers like some Khmer temple of Cambodia. My imagination runs wild as I get an exclusive opportunity of this crumbling place of worship. What a fabulous film or photo location! My brief solo adventure however, was trumped by my cabin-mate George, who undertook an unassisted - and unsanctioned - exploration all the way to the local airport on foot. George, BTW, is pushing 80. What began as a truncated day of abbreviated activities, turned out to be a mix of welcome relaxation and spontaneous exploration. Just goes to show that expedition cruising is always full of surprises.